That is not consistent with the conclusions of the 600-plus-page Climate Science Special Report, which is part of an even larger scientific review known as the fourth National Climate Assessment. The NCA4, as it's known, is the nation's most authoritative assessment of climate science. The report's authors include experts from leading scientific agencies, including the National Oceanic and Atmospheric Administration, NASA and the Department of Energy, as well as academic scientists. The report states that the global climate will continue to warm. How much, it says, "will depend primarily on the amount of greenhouse gases (especially carbon dioxide) emitted globally." Without major reductions in emissions, it says, the increase in annual average global temperature could reach 9 degrees Fahrenheit relative to pre-industrial times. Efforts to reduce emissions, it says, would slow the rate of warming. 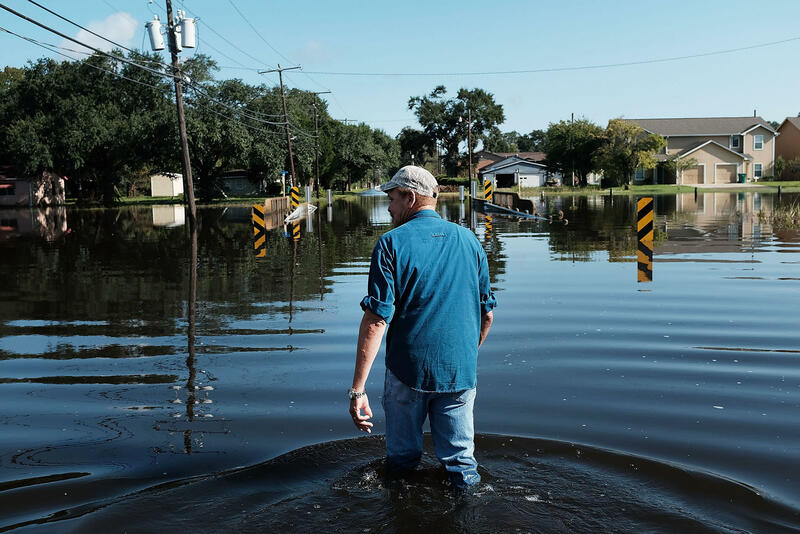 "This is good, solid climate science," says Richard Alley, a geoscientist at Penn State University, who says he made minor contributions to the report's conclusions on sea level rise. "This has been reviewed so many times in so many ways, and it's taking what we know from ... a couple of centuries of climate science and applying it to the U.S."
The assessments are required by an act of Congress; the last one was published in 2014. Alley says this year's goes further in attributing changes in weather to the warming climate, especially weather extremes. "More heat waves and fewer cold snaps, this is very clear," he says. The report also notes that warmer temperatures have contributed to the rise in forest fires in the West and that the incidence of those fires is expected to keep rising. The report also points out that heavy rainfall is increasing in intensity and frequency across the U.S., especially in the Northeast, and that is expected to keep increasing. Alley notes that "there's a little rumbling" among climate scientists who are concerned that the Trump administration will ignore this effort. "I think the authors really are interested in seeing [the report] used wisely by policymakers to help the economy as well as the environment." NPR has obtained a copy of the U.S. government's most comprehensive report to date on the state of climate science. The report is scheduled to come out tomorrow. It says that humans are the dominant cause of global warming over the past 60 years. And it also states that our weather is already being affected from droughts to flooding. NPR science correspondent Christopher Joyce is with us to discuss the findings. Hi, Chris. CHRISTOPHER JOYCE, BYLINE: Hi, Ari. SHAPIRO: We know the climate has been warming. So what does this report add to our understanding of climate change? JOYCE: First off, it's a summary of the very latest science. It's based on over 1,500 scientific research papers. And it's unequivocal. It says that human activities are the overwhelming cause of warming that the world's experiencing. And that warming is extraordinary. The last century is, quote, "the warmest in the history of modern civilization," and temperatures have increased over the last century by two degrees and will continue. Another important thing is the report points out that the scientific community has looked at all the alternative explanations for warming. And they insist, quote, "there's no convincing alternative explanation." And that's important because the Trump administration has a different view. Earlier this year, in fact, President Trump's EPA administrator, Scott Pruitt, said there's tremendous disagreement about whether humans are causing climate change. SHAPIRO: So help us understand the origins of this report. Was it intended as a message from government scientists to the Trump administration? JOYCE: I wouldn't say that it was intended. I mean, this has been three years in the making. The last one was in 2014. These aren't voluntary. They're not just ginned up for political reasons. They're mandated by an act of Congress. And the government's best scientists - several hundred of them - are required to do this to inform policymakers of what the scientific consensus is. I mean, it's as thorough as anything that's offered from the scientific community. It is the first one that's come out during the Trump administration. So it's anybody's guess. You know, given the political situation, I expect it'll be controversial. SHAPIRO: You've described the scale of climate change that the report describes. What does the report say about the effects of climate change - for example, on the weather? JOYCE: Well, that's one thing that's happened in the last few years is that science has been able to get more granular in terms of the effects of climate change. What does that mean for people on the ground, coastlines in the arid parts of the West, that sort of thing? So this assessment goes into more detail. Sea level is now about 8 inches higher than it was a century ago. And that's causing more flooding. And we can see it. We can measure it. There are more heat waves. There are more forest fires in the West. And also heavy rainstorms - the really heavy ones are getting even more intense and dropping more water. That's what we saw with Harvey. SHAPIRO: It seems like we're seeing examples of all of those just in the last year. Does this report make any recommendations? JOYCE: Not specific ones. I mean, these reports aren't designed to make recommendations. I mean, the idea is to just deliver the latest best science from - get the consensus of the community. However, it does point out that greenhouse gases are indeed the main culprit here, the greenhouse gases coming from fossil fuels - mostly carbon dioxide, for example. And it notes that the best computer models still predict that unless the emissions are somehow reduced in a major way, you know, the warming and its effects are just going to continue to get worse. So you could interpret that as being - you know, if things aren't done, it's going to get worse. SHAPIRO: NPR's Christopher Joyce with that exclusive preview of this report. Thanks very much, Chris. (SOUNDBITE OF THE POLISH AMBASSADOR'S "TAKE WING") Transcript provided by NPR, Copyright NPR.